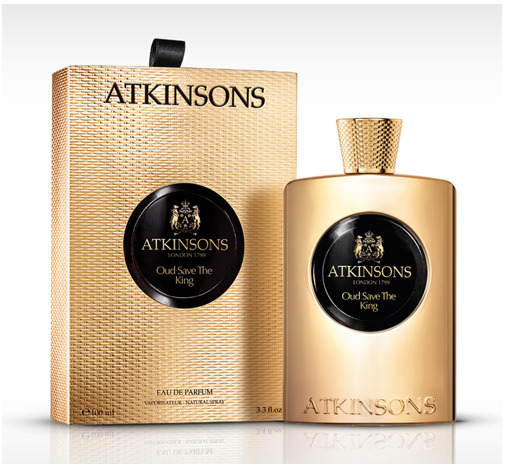 Oud Save The King is a popular perfume by Atkinsons for men and was released in 2013. The scent is woody-sweet. The longevity is above-average. It is being marketed by Perfume Holding. This is the end of a long journey for me. If there is one thing I find difficult, then it is to find the right fragrance among many similar fragrances, which are all the same somewhere and yet different in nuances. To understand what this means, here is a short review of the past. Marty Mcfly flees in DeLorean from the Libyan terrorists and accidentally travels to the past. Yeah well we don't have to go that far now. I met the scent Kalemat from Arabian Oud and was very enthusiastic. I was in a blueberry basin and didn't want to go out again. A beautiful fragrance, which is almost impossible to get and since then I've been keeping my little bottle like a treasure. The only scent that actually indicated blueberries in the scents. That's what I wanted to smell like in winter. As a tip of a twin fragrance was stated Oud save the King by Atkinsons. Of course I remembered it and wanted to test it quickly, but independently of that I blindly bought a fragrance that was supposed to be a fragrance twin of Guerlain's Spiritueuse Double Vanilla. Perry Ellis Oud - Black Vanilla Absolute moved in with me and the first sprayer put me back directly into the blueberry basin and I couldn't believe it, because by chance I had exactly the scent I wanted. Even today I love this fragrance and I love to wear it. There is no indication of the blueberries mentioned here, but I can perceive them. Maybe not as strong as in Kalemat, but it was enough for me and I was Happy. The Atkinson was far away, not completely out of memory, but I wasn't so eager to test it anymore. From time to time I also had the occasional feeling of having to test all the other twin fragrances, be it Ragba, 24, or Eau des Missons. Yes were nice, but not the same, in the end there is still the Atkinsons left. Should he perhaps top everything again? In between I had smelled him on paper, but no longer had the ambition to put him through his paces. I liked it, but a development on paper is not the same, so in order to finally get it over with, I ordered a small bottling from dear Shuqush, whom I would like to express my sincere thanks to once again. Now we have the 28.01.2019 and I have come exactly 4 months after my comment to the Perry Ellis to a result. No, they're not that alike. The direction is similar, but there are no blueberries here, or only with a lot of imagination. The beginning by the tea evaporates quite fast and then starts here a very fine suede note, which is very beautiful in itself and by Iris also becomes lightly powdery according to rank. A bergamot, or generally something fresh I do not perceive. The whole thing is not medical due to Oud, or musty, but woody. There's no more course, but it lasts all day. You can easily get over 9h and more if you wear this scent. At the end you get a slightly sweetish touch, a little vanilla wherever that comes from. This results in the impression of a light vanilla dough. In general, the fragrance is very light, no wummser, but it doesn't have to be. A beautiful fragrance that is unisex for me, but does not come close to my favourite. I'm not disappointed, I'll probably wear it once in a while. If you like more subtle suede and less vanilla, berries or rum, you should try this one. Maybe one of you knows the scents and can understand all that. Otherwise I am glad to have made this journey and will jump soon again into my Heidelbeerbecken. I have had this Atkinsons for about 2 years, but I use it less and less. What's the matter with you? Because this scent comes to me from time to time like an industrial perfume, made that way, not authentic at all. Comparable to a Primitivo red wine, which is very made, very fat, overbordering. One glass and you just can't take it anymore! I'm not buying Atkinson's use of noble essences anymore. The golden dress no longer deceives me. This immensely powdery becomes so exhausting over time that I would love to wash off the scent. No development at all, always the same aromas. Unfortunately, good marketing deceived me. You shouldn't judge a book by its cover, should you?